An exhibition featuring MSU Artist-in-Residence: Critical Race Studies Qais Assali. Please join the MSU Union Art Gallery and the MSU Department of Art, Art History, and Design in celebrating the opening of Costume Party at the Moslem Temple on Friday, March 15 beginning at 6pm, remarks will be offered at 6:30pm. 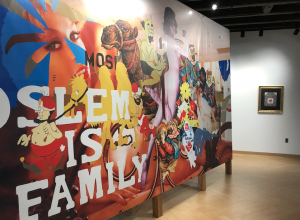 This solo exhibition features the work of MSU Artist-in-Residence: Critical Race Studies Qais Assali. Assali’s interdisciplinary work stages questions between site and the body in relation to his own identity and locale in order to debunk metaphoric surrounding contested geographies. This exhibition was made possible thanks to collaborations with many others. Parade Float was made in collaboration with Syrian-American Artist Amanda Assaley. Mosaic Fountain was made by Syrian-American Artist Michael Howard. O My Lord, Increase me in Knowledge, was painted by Syrian-American Artist Reem Taki. Costume Party at the Moslem Temple is organized by the MSU Union Art Gallery at Michigan State University. Support for this exhibition and associated programming is provided by the MSU Federal Credit Union, the MSU College of Arts & Letters, MSU Department of Art, Art History, and Design, the MSU Eli & Edythe Broad Art Museum, MSU Museum, MSU Library Digital Scholarship Lab, MSU Library Special Collections, MSU Muslim Studies Program, MSU Students United for Palestinian Rights, University of Michigan Special Collections Research Center, and the Arab American National Museum. Special thanks to Deborah Margolis, Jose Luis Benavides, Sally Howell, Penny Gardner, Becky Gaines, and Michael Dean. Qais Assali (b. 1987 Palestine) is currently a Visiting Assistant Professor and Artist-in-Residence at Michigan State University. His works with video, installation, lecture performance, sound, photography, and in the archives seek to engage and subvert national geopolitical power dynamics. His interdisciplinary work stages questions between site and the body in relation to his own identity and locale in order to debunk metaphoric surrounding contested geographies. Assali’s work has been internationally exhibited at Jeune création, Paris (2016); 6018North, Chicago (2018); Festival Artes Vertentes de Tiradentes, Brazil (2016); The Overlook Place, Chicago (2018); solo exhibitions at Akademirommet, Kunstnernes Hus, Oslo (2015); and Khan Al Wakala, Nablus (2016). Assali has been a faculty member at a number of academic institutions in Palestine including Al-Ummah College, Jerusalem, Palestine. Assali holds two master’s degrees – an MA in Art Education from the School of the Art Institute of Chicago and MFA from Bard College Milton Avery Graduate School.